Rüsselsheim/Frankfurt. Chancellor Angela Merkel visited the Opel stand on Thursday during her tour of the Frankfurt International Motor Show (IAA) and informed herself about the Rüsselsheim carmaker’s motor show premieres. The chancellor was greeted by Opel CEO Michael Lohscheller and Philippe de Rovira, Vice President Finance and Chief Financial Officer (CFO). Chancellor Merkel was accompanied by Federal Minister of Transport and Digital Infrastructure, Alexander Dobrindt, the prime minister of Hesse, Volker Bouffier and Matthias Wissmann, the president of the German Automobile Association (VDA). 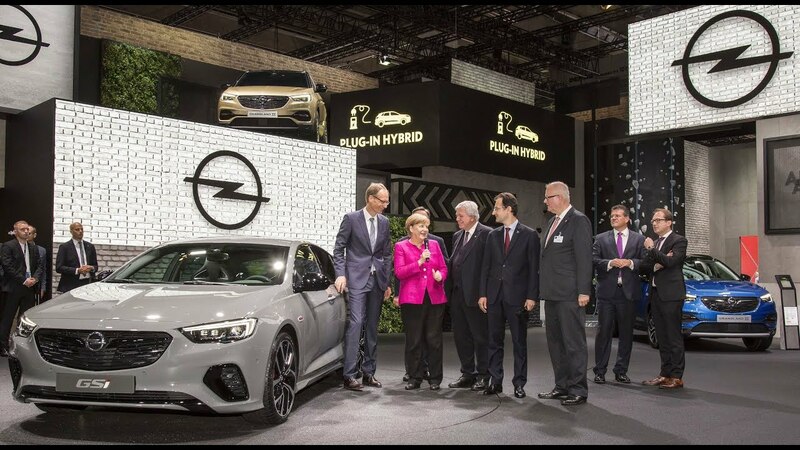 Michael Lohscheller explained to Chancellor Merkel the important role played by the new Insignia, which celebrates its world premiere at the IAA as the top-of-the-line GSi version. “Developed and produced in Rüsselsheim, the Insignia is an important part of the future – for Opel, for Rüsselsheim and for the state of Hesse,” said Lohscheller. Following the official opening by Chancellor Merkel, the public days of the IAA will begin at the weekend. The Opel stand (D09 in Hall 8.0) at the IAA takes the form of a small town called “X-Ville” (pronounced “Crossville”) with an “X-Corner” climbing wall, Insignia Exclusive Studio and much more. True to the brand-claim “The future is everyone’s”, people are the focus of the Opel stand. In addition to the Insignia GSi, the Grandland X – with which Opel will challenge the competition in the booming SUV segment – also celebrates its world premiere at the IAA. Other highlights at the most important motor show of the year are the Insignia Country Tourer, Opel Exclusive, the Vivaro Tourer and the Vivaro Life.